Villa Laurent was built Sept 2008 and is located on Atlantic View. It provides a great view of the Caribbean Sea and the Atlantic Ocean with the peninsula between. The golf course and the Marriott resort are at the foot of the hill. Choice of either body of water is available for swimming. Great for star gazing. There is a constant cross breeze. The rooms are spacious in this 3300 square foot villa, all appliances are brand new. There is a patio in the back for dining. View the Caribbean from your bed in the master bedroom. There is a 42 inch LCD HDTV in the living room. Tiled floors. This is a no smoking Villa. Restaurants are within walking distance. The beach is only 20 minutes walk from Villa. The airport is less than 5 minutes away. Aziz and Nneka Laurent are from the Caribbean. Nneka was born in St.Kitts and Aziz was born in Dominica. We met in New York City. We enjoy photography, gardening and cooking. Nneka is an excellent cook (reason for the very spacious kitchen). Nneka is a volunteer Docent at the Blanton museum in Austin, and Aziz is a research scientist in Austin Texan. We built our dream vacation home-rental in Frigate Bay because of the very unique location. How many places on earth where one can savor the beauty of two lovely bodies of water from one location. We enjoy the friendly people and the varied dishes of the West Indies. Just a 15-20 minute walk to the Atlantic or the Caribbean. Very unique view of the Caribbean and the Atlantic with the peninsula between. Tiled patio and balcony for dining and lounging. Hotel style security safe available. The house is spacious and located in a quiet neighborhood. Our favorite aspect of the villa was sitting on the front porch drinking in views of both the Atlantic and the Caribbean while enjoying delightful tropical breezes. This is a great place to stay when visiting this lovely island. Thanks for the glowing review, we appreciate your kind words. Have a great day. Our stay on the island of St.Kitts was extremely enjoyable. This property match all our needs and expectation. The owner and island contacts were very professional, responding immediately to any questions or concerns. We would highly recommend this property and would stay there again on our next visit to the Island. Thanks very much for your kind and generous review. The property is great, very clean, well appointed, amazing view, centrally located on the island with easy access to beaches, attractions and the airport. Highly recommend. Thanks very much for the review and the 5 stars. It is greatly appreciated. My family and I really enjoyed our vacation at this house. The House was much more spacious than we expected, and it was well equipped and everything was in good working order. Frigate Bay is perfect for a vacation in St Kitts, you can walk to the beach and golf course within 20 minutes, and lots of taxis in the area. No complaints and we would recommend it. Thanks for the favorable review. We try to please our guests as best we can. We are so happy that you enjoyed your stay. We are very pleased with our stay at Villa Laurent. The view is wonderful and the location convenient. What a pleasure to sit on the balcony to enjoy the view and breezes. We even saw some monkeys from the balcony one day. The photos posted do not do the property justice. The kitchen is huge and well equipped. The building is well made and maintained. There are an abundance of restaurants and activities to enjoy. We frequented Reggaes Beach Bar and Grill in part to visit the monkeys but also the setting was on the beach and food was good. We also liked the Ritual Sushi and Caio Italian restaurants. We took a day trip to Nevis and had a private taxi tour of the island which was quite worth it. The Botanical Garden on Nevis was a highlight. 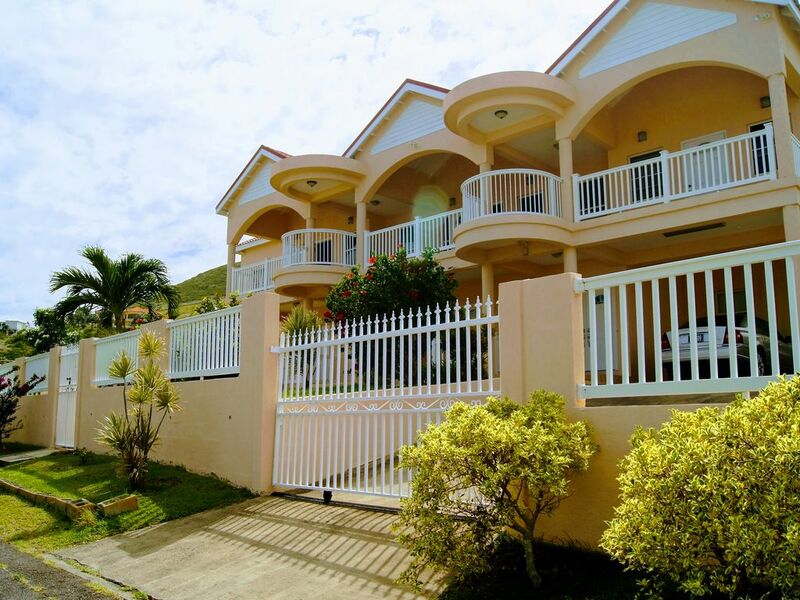 We would recommend Villa Laurent and St Kitts to our friends and family. Thanks very much for the five star review, it means a lot to us. I mailed the refund to you today. Please let me know when you receive it. Atlantic View. Can Walk to Beaches, Golf Course and City. The Villa is less than 15 minutes drive from Christophe Harbour, a high end destination for mega yachts. It will feature million dollar villas, prime shopping sites, a golf course, fine dining restaurants and 5 star hotel,resort. Other Activities: Shopping and boating.